It is heartening to know that Hindus have always believed in worshiping the Male and Female aspect of God together and that Sri Ram was a staunch devoted husband. Not only that, one says Seeta Ram and Radha Krishna and as one can see the female name gets precedence. As the name signifies, Karva meaning a clay pot and chauth corresponding to the fourth, this festival is commemorated on the fourth day after the Full Moon in Kartik month of Hindu calendar. 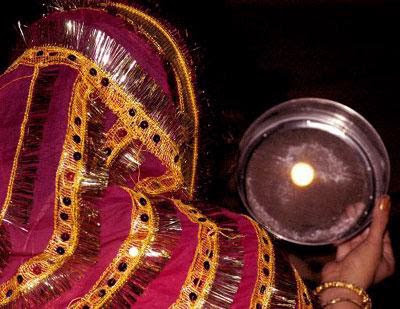 The fast of Karva Chauth is kept 9 days before Diwali. In the olden days, a woman was dependent on a man, whether he was her father, brother, husband or Guru. Without a man she was considered incomplete. Today that may not be the case. But it is still refreshing to see a loving wife or a loving husband.The festival of Karva Chauth was earlier emerged as a day to celebrate the season of autumn and enjoy the company of friends and relatives. This festival is glorified and widely solemnized by the Hindus all over the world. On this day it is customary for the wife to fast the whole day. She does not drink water either. She paints her hands and feet with henna, dresses generally in red apparel and on her hair parting she smears vermilion powder. It is believed that a Pati-Vrat woman has the power to confront the God of Death, Yama. This Karva Chauth fast is undertaken by the wife, so that the husband enjoys a long and prosperous life. A married woman who observes this vrat is called ‘Saubhagyavati’ (joyous and happy state of wifehood). This katha (narrative) first took place between Siva and parvati. Siva told Parvati about the significance of Karva Vrat. In Dwapar Yuga, Draupadi asked Lord Krishna about the vrat of Karva Chauth. Thereafter, the very first time this vrat was observed in the town of Shukraprastha by Veeravati, the daughter of Vedsharma and Leelavati. Ever since this vrat has been observed by married women till the present day. The story of Karva is well known. Her husband was caught by a crocodile. Karva bound the crocodile with a cotton yarn. She then asked Yama to send the crocodile to hell. Yama refused. Karva threatened to curse Yama. Yama, afraid of being cursed by Pati-vrat (devoted) wife, sent the crocodile to hell. Karva and her husband enjoyed many years of wedded bliss. The fact that Yama was afraid of being cursed by a devoted wife showed the power a good faithful woman!Maybe you have heard the story of Savitri. The latter followed Yama, who carried away her dead husband. Yama said that she could ask for any other boon except for the life of her husband. Savitri asked that she be blessed with children. Yama agreed. Being a Pati-Vrat wife, Savitri would never any other man, be the father of her children. Yama was left with no other choice but to restore Savitri’s husband to life.A few days before Karva Chauth, married women buy new karvas, the spherical clay pots and paint them on the outside with beautiful designs. Inside the pot, they put bangles and ribbons, home-made candy and sweets, make-up items and small clothes e.g. handkerchief. The women then visit each other on the day of Karva Chauth or immediately afterward, and exchange these karvas. Season-wise, soon after the harvest, it is an excellent time to enjoy festivities, meet one another and exchange gifts. During the time of Karva Chauth, parents send gifts to married daughters and their children. The fast of Karwa Chauth observed by Indian women is the most difficult fast for the long life and prosperity of their husbands. On the festive day, married women wears special clothes usually red or pink saree/suit. They adorn themselves with best jewelry, colorful bangles, bindi and apply mehandi designs on both palms. In the evening, they worship Ahiva, Parvati, Ganesha, Kartikeya and a Kalash or Karwa filled with sweets. Application of henna is considered auspicious for married woman and forms a mandatory part of Karva Chauth rituals. According to a popular belief, married woman, whose mehndi (henna) is gets dark, would get loads of love and care from her husband. In addition to this, henna symbolizes prosperity and good luck. Therefore, it can be said that it is a good luck charm for the married women in India. The auspicious ritual of the application of henna is performed on the day. However, nowadays, people also apply mehndi one day prior to the festival. Fasting is an important part of the celebrations of Karwa Chauth. 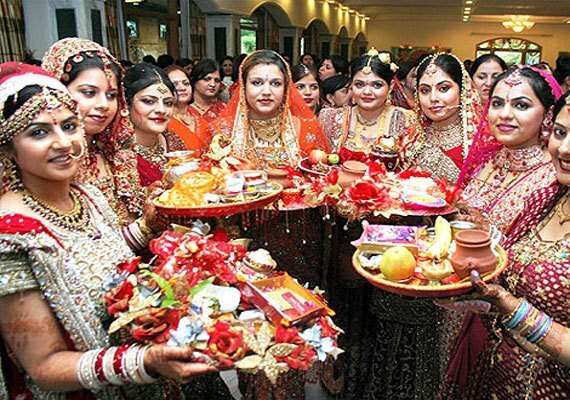 After having the scrumptious meal called ‘sargi’ in the pre-dawn time, women observe a one-day fast for Karwa Chauth. Fasting symbolizes the ability of a woman to stay calm even after starving for a long time. Actually, on Karva Chauth, a married woman is bound to stay starve all through the day until the moon rise, without drinking even a drop of water. They break the fast only after having a glimpse of the moon rise (on their thali that is filled with water or through a sieve) and their husband. 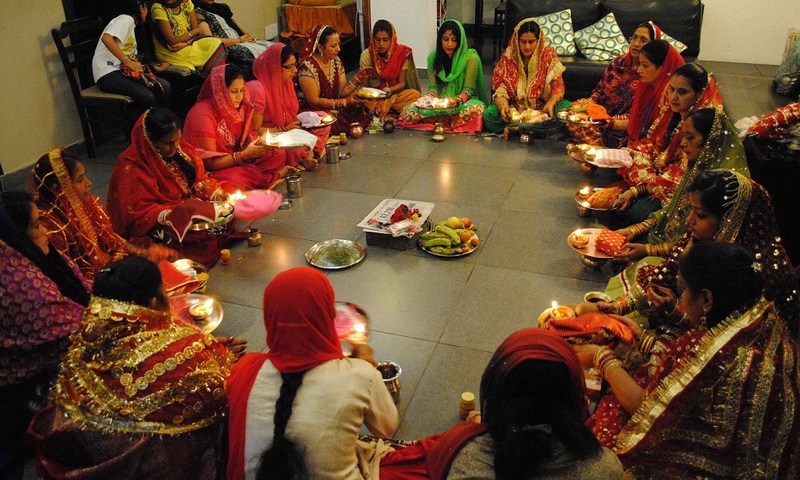 As a part of the traditions, married women clad themselves in beautiful dress, on Karwa Chauth. The attire for the day is strictly traditional. Therefore, you would get to see variations in the traditional wear including sarees, lehenga and salwar-kameez. The chosen color for the dress is either red or maroon, because both the colors are considered auspicious for married women. The women would accessorize themselves with matching pieces of jewelry, including colorful bangles, heavy earrings and necklace. 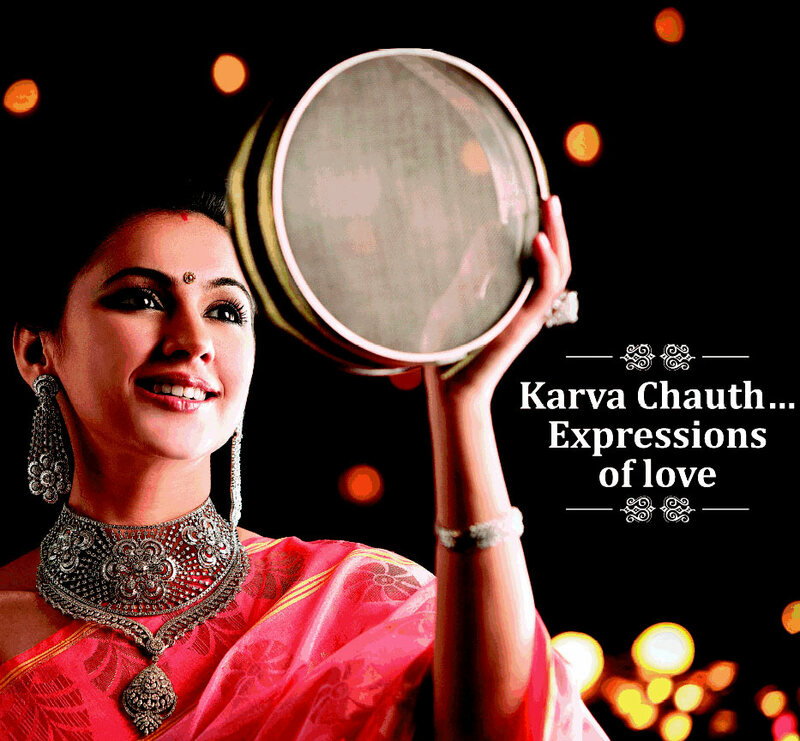 Karwa Chauth PujaOne of the important traditions of Karwa Chauth is puja. 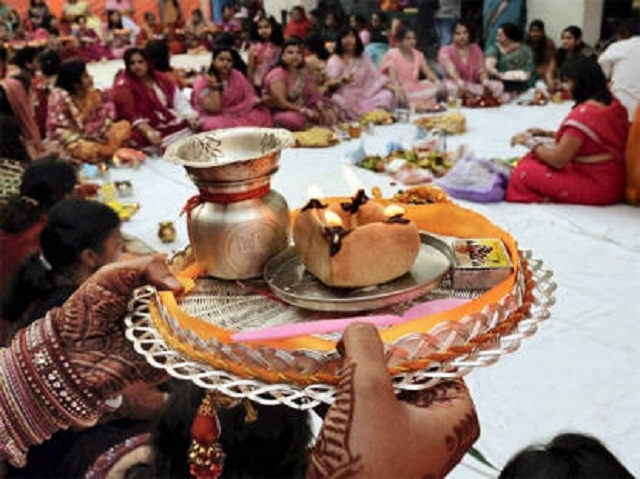 The pooja is conducted somewhere between 4 pm and 5 pm, by the married women. One of them would call upon other married women to take part in the puja organized at her place. As a part of the tradition, a two-inch tall idol of Goddess Gauri is made using cow dung and a picture of the idol is kept aside, because she is the deity worshiped on the day. Songs are sung for Karwa Chauth puja aarti. Ritual At Moon Rise The ritual at moon rise marks the culmination of the festival. 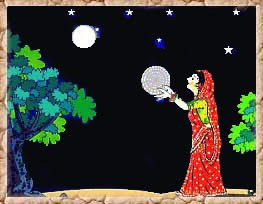 As the day proceeds, the women who have observed Karwa Chauth vrat (fast) would eagerly await for the moon to rise in the evening. The moment moon rises, they would have a glimpse of the moon through a sieve or look at the reflection of the moon in their thali. Thereafter, they would have a glimpse of their husband through the same sieve. Next, the women would drink water to break their fast. This marks the culmination of the rituals of Karva Chauth. This is followed by feasting. Mother-in-law prepares an elaborate Sargi (the pre-dawn Karva Chauth meal) when her daughter-in-law observes her first fast. She wakes up early to prepare a sumptuous and lavish meal inclusive of sweets and other delicacies for daughter-in-law. She blesses her daughter-in-law saying ‘Sada Suhagan Raho’ which means, ‘may you always enjoy a blissful married life’ when the latter touches her feet with reverence. She also presents her daughter-in-law with gifts, which may be a piece of jewelry or a saree on the first Karva Chauth. Baya is a gift given to a daughter’s mother-in-law on the occasion of Karva Chauth. Mothers of newly wed daughters bring gifts for all her family members. Some utensils are also included in the baya which are to be distributed amongst women who join the newly-wed on her first Karva Chauth Puja.